The fifth matchday of La Vinotinto’s 2018 World Cup qualifying campaign yielded the first point for Noel Sanvicente’s men, yet this will be of little comfort to fans who were seconds away from celebrating a morale-boosting win. Here, Hispanospherical.com provides a match report and offers some thoughts on the game. With the last touch of the game, Raúl Ruidíaz rescued a Peruvian point and ruined what was so close to being a history-making night for Venezuela. La Vinotinto had never won a World Cup qualifier away in Peru (previously managing a solitary draw) and thus, having led 2-0 on the hour, were just half an hour away from an unanticipated morale boost. Alas, ultimately they failed to survive the onslaught by mere seconds. Viewed as a whole with a detachment rarely found in the South American stands, Noel Sanvicente’s underperforming men were perhaps fortunate to even get a point from this game. However, upon the full-time whistle in Lima, this is not an opinion that many away fans would want to hear, let alone be in accord with. Indeed, not only were they on the back-foot for the majority of the final third of the match but also for the first quarter, when the hosts – backed up by the urges and instruments of an expectant home crowd – repeatedly exploited an inexperienced Venezuelan back-line. In the opening exchanges, Peru found a lot of space both in the middle and and on the flanks of a Venezuelan defence which, Oswaldo Vizcarrondo aside, had less than a dozen caps between them pre-game. The first genuine scare of note came in the eighth minute when a ball was dinked over from the left into the area that Jefferson Farfán only narrowly failed to make strong contact with, instead scuffing wide. Not long afterwards, a cross from roaming right-back Luis Advíncula found Claudio Pizarro in space, but the veteran striker’s header was comfortable for goalkeeper Alain Baroja. Holes continued to be found that necessitated last-ditch tackles and blocks but it was in the 24th minute that Peru really should have taken the lead. Here, an appalling clearance from Ángel Faría – playing instead of the suspended right-back Roberto Rosales – went straight to Farfán who immediately fed Paolo Guerrero in the area. However, despite the time and space he was afforded, he was unable to divert the ball either side of Baroja, who instead made an instinctive block. Yet, though a Peruvian opener seemed on the cards, the Venezuelans surprisingly began to get a foothold into the game, creating a string of chances. In the 26th minute, a counter-attack was spearheaded by Josef Martinez, who fed strike-partner Salomón Rondón on the left who, in turn, returned a point-perfect cross that Martinez volleyed, causing a fine save from Pedro Gallese. Three minutes later, Rondón himself had an opportunity, seizing upon a forward ball on the inside-right and hitting a low strike across goal that Gallese padded away. Then, a minute later, a free-kick from the returning Rómulo Otero – who had struggled with a couple of previous attempts – dipped just before Gallese, causing the Juan Aurich goalkeeper to awkwardly parry the ball out. Soon after, however, the breakthrough that less than ten minutes prior seemed improbable occurred. Málaga midfielder Juanpi, who was making a rare international start and is poised to be a fixture in the line-up for the foreseeable future, burst into the area and was rashly upended for a penalty. Otero thus stepped up and confidently dispatched the spot-kick. The previously boisterous home fans fell silent and several minutes later their representatives nearly fell another goal behind. This time, Juanpi swung in a free-kick that the head of centre-back Wilker Ángel powerfully connected with, yet Gallese pulled off a sensational save, preventing what seemed like a certain goal. Subsequently, the hosts struggled to regain their earlier dominance, a situation that continued into the first quarter of the second half. Barely a minute after the restart, the visitors could have had a second when another Juanpi free-kick curled towards Vizcarrondo and Mikel Villanueva in considerable space, yet a lack of communication and/or anticipation led to the ball missing the target. Ten minutes later, however, the latter did manage to double the lead. After Juanpi won a corner, he swung in another pin-point cross that his Málaga team-mate Villanueva, unmarked at the back post, thundered home on the volley. Elation spread amongst the Venezuelan ranks on the pitch, in the stands and at home. Not just the first point of the campaign, but three of the blighters seemed very much on the table begging to be collected, requiring only some professional shepherding over the finish line. Easier said than done, of course, and it did not take long for Los Incas to ground their briefly stratospheric opponents back on planet earth. Indeed, having come close just a minute after Villanueva’s goal, they halved the deficit a minute after the hour-mark. A long ball was knocked into the air and then headed on by recent substitute Raúl Ruidíaz into the path of Guerrero who did well to take the ball into his stride and then strike home – though goalkeeper Baroja really should not have allowed the ball past him. Though the Flamengo forward rushed to pick the ball out of the net in order to force a quick restart this was in fact a landmark moment for him, as he became Peru’s undisputed all-time top goalscorer. This goal really swung the momentum pendulum back into the hosts’ favour and for the remainder of the game they were to increase the pressure on the visitors to what ultimately proved to be unbearable levels. Vinotinto nerves were certainly rattled in the 68th minute, though not as much as their own crossbar, which Guerrero nearly pulverised with a bullet header from a corner. Manager Sanvicente could sense as much as anyone that the winds had decisively changed and so made a double substitution a couple of minutes later. Not only did he grant Adalberto Peñaranda his debut (replacing Martínez) but he also took off creative catalyst Juanpi in order for his replacement Alejandro Guerra to add some defensive grit and experience to the ranks. 12 minutes later, following ever more narrow squeaks and uncertainty, Venezuela’s other main attacking threat Otero was withdrawn to be replaced by holding midfielder – and debutant – Carlos Cermeño. Sanvicente was evidently trying to preserve his side’s slim advantage and bring some much-neeed order and organisation to what was a rather open game – albeit one with the ball largely in the Venezuelan half. When, in the last minute of regulation time, Edison Flores was fed a return-ball inside the area yet from close range could only hoist the ball over both Baroja and the bar, many a Vinotinto fan must have felt an historic win was all-but-assured. Alas, concentration levels failed at the very last hurdle. After some attacks were momentarily thwarted, mental lapses afforded space on the left for Flores who compensated for his miss by providing a pinpoint cross for Ruidíaz, who slipped away from Ángel, to nod home. The goal was literally the last touch of the match. The dejection in the Venezuelan camp did well to mask the fact that this was the first – and somewhat unanticipated – point that they had picked up. If they can overcome the late psychological blow, then the home humiliation against Chile on Tuesday that some have feared may not come to fruition after all. 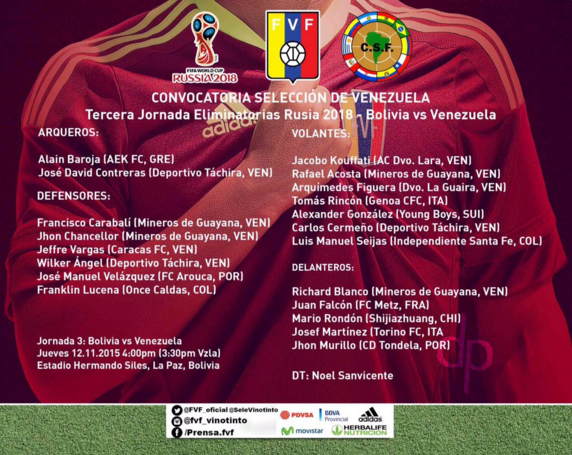 Venezuela came into the game without several individuals who have started recent qualifying games. Some of these players were either suspended (Roberto Rosales, Luis Manuel Seijas and Sema Velázquez), left out the squad (Ronald Vargas, Christian Santos and Gabriel Cichero) or, in the case of at least one, started on the bench (Alejandro Guerra). Some players who stepped in for rare starts impressed and should expect many more caps in the foreseeable future. Of these, Juanpi, who has emerged to become a La Liga regular this season, perhaps put in the strongest performance. Not only did he win the penalty for the first goal and set up Villanueva for the second but, were it not for the heroics of Gallese and a slight-mix-up between his team-mates, he could well have had a hat-trick of assists to his name. This was the first time he has started a competitive international and it certainly will not be the last. Rómulo Otero, another versatile attacking midfielder and impressive set-piece taker, also made his mark. The 23-year-old has gained more caps than Juanpi but has struggled for international appearances over the past two years due to injury. Against Peru, he made a welcome return to the line-up, coolly slotting home a penalty kick, driving at defenders and causing problems from set-pieces. With regard to free-kicks at least, many fans have hoped that he would be the long-term successor to Juan Arango though, as this match demonstrates, while future opportunities are certainly on the cards, he will have some stiff competition in this department from his Málaga-based team-mate. Mikel Villanueva, who like Juanpi is registered with Málaga but instead plays for their reserve side Atletico Malagaugeno, also had a game to remember. This was his second appearance following last month’s friendly debut and he not only scored a memorable thumping goal but came away with more credit than most of his defensive colleagues. With Fernando Amorebieta having retired, Andrés Túñez falling out of favour and Gabriel Cichero all but a nowhere man at club level, an opportunity has surely opened up at left-back. Unfortunately, not all players who stepped in can be assured of future appearances after this international break. Right-back Ángel Faría and centre-back Wilker Ángel both played their parts in the concession of goals and were often caught out of position, struggling to keep up with the pace of play. Against Chile, they will more than likely be dropped in favour of Roberto Rosales and Sema Velázquez, both of whom will be returning from suspensions. Furthermore, though a first-team regular and one less likely to lose his place on Tuesday (UPDATE (29/3/16): If reports are to believed, it looks like he has in fact lost his place), goalkeeper Alain Baroja nevertheless really needs to raise his game. Once again, he showed moments of uncertainty and was at fault for a goal – this time when he awkwardly allowed a fairly straightforward shot from Guerrero to creep under his ineffectual dive. Add this to his amateurish mix-up with Vizcarrondo for Paraguay’s late winner in October and his dreadful clearance against Ecuador in November that led to their second goal and this gives the average Venezuela fan quite the unwanted memory bank to hold against him. More positively, Josef Martínez went some way to providing the answer for the striking dilemma of the decade: Who, If Anyone, Should Partner Salomón Rondón? The West Brom striker has often looked more involved and participated in more direct moves when the younger, pacier, Torino forward has been playing a supplementary role. There were glimpses of this against Peru, particularly when the pair began Venezuela’s first-half re-emergence into proceedings as a fast-paced counter-attack led to the pair combining with Martínez ultimately only being denied by an impressive save. Unfortunately, as Rondón picked up his second booking of the campaign, they will not be reprising their partnership against Chile. Nevertheless, as things stand, if in future games Sanvicente opts to give Rondón some close on-field support, Martínez is surely currently ahead of the likes of Christian Santos, Richard Blanco and Adalberto Peñaranda in the pecking order. Lastly, though in the immediate aftermath of this result nobody really wishes to hear this, the Venezuelan side, much of which was lacking in familiarity with one another, showed great character through most of the game. After 25 minutes, a defeat by at least two or three goals seemed likely and the thought that they could ever be two clear goals in front away to Peru could only have come from the mind of the most optimistic futurologist predicting a distant age at least a generation from now. To withstand the early tide and then play effectively within their limitations in order to gain their first point of the campaign represents progress. To follow this up with a strong showing against Chile at the ground of Sanvicente’s former club Zamora would do much for fan and team morale. Peru (4-4-2): Gallese; Advíncula, Zambrano, Ascues, Vargas; Ballón, Tapia (Lobatón. 51′), Cuevas, Farfán (Flores, 60′); Pizarro (Ruidíaz, 60′), Guerrero. Venezuela (4-4-2): Baroja; Faría, Ángel, Vizcarrondo, Villanueva; Juanpi (Guerra, 70′), Rincón, Figuera, Otero (Cermeño, 81′); S. Rondón, Martínez (Peñaranda, 70′). This entry was posted in Venezuela National Team and tagged Alain Baroja, CONMEBOL, CONMEBOL Qualifying, Josef Martínez, Juanpi, Mikel Villaneuva, Noel Sanvicente, Paolo Guerrero, Peru, Raúl Ruidíaz, Rómulo Otero, Russia World Cup 2018, Salomón Rondón, Venezuela, World Cup Qualifying on March 28, 2016 by hispanospherical. The fourth matchday of La Vinotinto’s 2018 World Cup qualifying campaign yielded the fourth consecutive defeat for Noel Sanvicente’s charges. Here, Hispanospherical.com provides a match report and offers some thoughts on the game. What began as bottom versus top ended as bottom versus top yet, for now at least, Noel Sanvicente is still the Venezuela manager. A replacement had been rumoured beforehand and at least another one has been linked since the final whistle was blown in a disenchanted Cachamay stadium. Although Chita emphatically ruled out resigning immediately after this fourth consecutive qualifying loss, he is not really in a position to determine his own fate. With four months from now until matchday five, the Federación Venezolana de Fútbol (FVF) have got considerable time to weigh up how they envisage the remainder of the seemingly doomed Russia 2018 campaign. This may be partially revealed as soon as Monday 23 November, as a meeting with Sanvicente has been scheduled. Before kick-off, fan discontent was already high, a fact reflected in the vast numbers of empty seats – a far cry from a near-full crowd of 35,076 who turned up to the Estadio José Antonio Anzoátegui for the same fixture three years ago. Much of the Puerto Ordaz public no doubt felt scarred and short-changed from the three other dreadful Vinotinto encounters that have taken place in the same ground over the past two months. Nevertheless, those who did attend brought with them some vocal, giddy, enthusiasm that could only be gradually tamed by events. Many were excited to get a good look at a vast array of their leading representatives, all of whom currently play for overseas clubs in, remarkably, 11 different countries. This was a much-changed side from the one featuring five home-based players that was seen off by Bolivia at high altitude. It combined established cracks and familiar faces with a few individuals who many hope will be long-term regulars (namely injury-hit Rómulo Otero and the recently converted pair, Christian Santos and Jeffrén Suárez). Alas, it did not take long to dissipate the rather optimistic hope that, in spite of recent performances, this encounter against CONMEBOL’s most in-form nation would be when things suddenly gel. Though the hosts just about held their own in the opening exchanges, the 11th minute witnessed Pumas striker Fidel Martínez receiving a short pass in a disconcerting amount of space before firing into the back of the net. The Venezuelan back-line breathed a collective sigh of relief upon seeing the offside flag but their mood did not last long. Following a failed attack just four minutes later, they were caught hopelessly out of position as right-back Juan Carlos Paredes simply dinked a ball over into the central area to Martínez who had the time to control and strike home. Highlighting the hosts’ defensive woes, it was right-back Roberto Rosales – albeit, with little hope of success – who was the closest to putting in a challenge, with centre-backs Oswaldo Vizcarrondo and ‘Sema’ Velázquez never in the race. Ecuador were apparently aware of Venezuela’s lack of pace at the back and later in the half were only narrowly denied with a couple more speed battles in open spaces that they instigated via chipped central passes. No tactical know-how was needed for the second goal, however, though home fans will have felt a dispiriting sense of déjà vu. In the 23rd minute, it seemed Venezuela’s – and, perhaps, Sanvicente’s – fate was sealed when the pass out by goalkeeper Alain Baroja went awry. It was far too short for Vizcarrondo, who was beaten to the ball by Miller Bolaños who, in turn, nudged it to Jefferson Montero. The Swansea City winger quickly passed it back to Bolaños on the left side of the area and the Emelec man was able to return the ball to the centre for the incoming Montero, who doubled the lead with relative ease. While the culprit was different – for most observers, anyway – the goal inevitably drew comparisons with the mix-up involving Vizcarrondo and Baroja for Paraguay’s late winner in the same ground a month ago. Deflated on the pitch as well as in the stands, Venezuela struggled to inspire genuine hope of a comeback. Otero seemed the most likely catalyst with his occasionally testing balls into the area, bursts of pace, plus an ambitious shot or two. It was his run into the left side of the area in the 43rd minute that created a chance of sorts for Jeffrén; alas, he shot too close to goalkeeper Esteban Dreer. Just a minute prior, the ex-Barcelona wide man had fashioned a chance for himself when, from the right, he cut onto his left and struck a shot a yard or so wide from the edge of the area. This slight momentum continued and grew in the early stages of the second half. NEC Nijmegen’s top-scorer Santos was to come close twice in as many minutes. Firstly on 52 minutes, he got onto the end of Rosales’ cross but his header, though powerful, was directed straight at Dreer. Soon afterwards, he received a flick-on by Salomón Rondón and beat Dreer to the ball, nudging it around him, though was ultimately denied by a defender guarding the exposed net. Alas, just several minutes later as the hour mark approached, the contest was effectively over. From a break, Montero paced up the left to cross in a hanging ball that was met in space 16 yards out by Felipe Caicedo. Unmarked, the Espanyol striker powered a spectacular header into the top left-hand corner. In the remaining thirty minutes, Ecuador continued to attack without increasing their lead. As has often recently been the case with Venezuela’s opponents, the home spectactors were left with the feeling that if their rivals had really needed at least one more goal, then they would have got it. The closest they did come, however, occurred in the 69th minute when a phenomenal 35-yard left-footed free-kick from Walter Ayoví venomously curled over the wall and then rattled off the highest point of the right-sided post. Goal-wise at least, Venezuela were to have the last say. Their consolation came with little more than five minutes left as substitute Josef Martínez arrived unmarked at the far post to side-foot home Rosales’ cross from the right. Much as the Torino striker wanted to rouse his team-mates for an ambitious grand finale, it was the visitors who looked more likely to find the net. Indeed, as the game entered stoppage-time, Ecuador broke on a counter with at least a man advantage, but Rosales just about caught up with Walter Ayoví to commit a foul a couple of yards outside the area, for which he received a booking. Nevertheless, with a 3-1 away victory, fans of La Tricolor will be as delighted with their fourth consecutive win as La Vinotinto followers will be dejected with their fourth straight defeat. What follows are some thoughts on this encounter. Greece, France, Spain, Portugal, Switzerland, Colombia, Italy, Chile, England, Belgium and the Netherlands. These are the countries in which the Venezuelan starting XI play their respective domestic football. All different and all overseas. Given the weakness of the Venezuelan top-flight, the latter is perhaps not so much a problem but the former surely is. While several have long-standing experience of playing together at international level, this is certainly not the case for new ‘recruits’ such as Jeffrén and Santos. These two men are past their mid-20s and have only recently become eligible to represent La Vinotinto, having moved away from Venezuela with their families while very young. Of course, most fans are always excited to see their disparate representatives all on one field together. However, it is hard not to avoid the feeling that their distances from one another for most of the year are not really conducive to effective team play. Indeed, familiarity amongst players at club level is a huge asset for international managers who are usually short of preparation time, as has been evidenced by the last two World Cup-winning sides, Germany and Spain. While many South American nations have their leading talents scattered across the globe (mostly in Europe), the diversity of leagues represented is easily the highest amongst the current Venezuelan crop. Although a typical Argentina or Brazil squad may draw upon talents based in seven or eight different countries, the cream of the crop largely come from no more than three or four. While recent results for these two decorated nations may not be meeting past standards, their records from the past decade or so are nevertheless envied by the vast majority of national federations. Thus, though Venezuelans should be proud to now have so many players plying their trade in highly competitive leagues, it could well be that they are currently at a difficult transition phase in their footballing development. Indeed, while it may only provide one piece of the puzzle, in order to see more unity and cohesion on the pitch we may all have to wait until more top players are clustered in no more than a handful of different leagues. In such a scenario, irrespective of whether or not they play for the same teams, not only would they be experiencing broadly similar playing styles, surfaces, cultures etc. but there would be more opportunities to socialise off the pitch. Fostering a collective team spirit is every bit as important as a functioning playing system. Another defeat for Noel Sanvicente and another unwanted record. Venezuela have now got off to their worst start in World Cup Qualifying since the campaign for USA 1994. This was in a different format and consisted of a run of seven straight losses that, on the last matchday, was ended by a solitary victory. If Chita‘s current charges are to avoid again making history for the wrong reasons, their best chance may be in the next encounter away to Peru in March – quite a challenge in itself. Otherwise, their subsequent encounters in the 18-game process are against Chile, Colombia, Argentina, Uruguay and Brazil. For Venezuela at least, there really are no easy games in CONMEBOL qualifying. Such regression has understandably irked fans. Not only are the results very poor but there is no discernible style to Venezuela’s play and there is little awareness of what the manager is trying to achieve. Consequently, analyses of team performances seem increasingly unenlightening. Even if a player shows glimpses of promise – for this game, Josef Martínez’s goal and general drive to go forward should not go unremarked upon – not only does it seem relatively minor but also, they seem to have prospered in spite of, rather than because of, whatever system Sanvicente is trying to implement. Although they may just be idle rumours, two Argentines have been linked with replacing him as national boss. Firstly, 2014 Copa Libertadores-winning Edgardo Bauza of San Lorenzo and, even more eye-raisingly, renowned maverick Marcelo Bielsa, formerly of Argentina and Chile, whose most recent job was at Marseille. Even if it does not come from either of these two men, there is certainly a threat to the position of Sanvicente and he will have to wait until Monday to discover his fate. UPDATE (23 November 2015): Following a meeting with the FVF, Noel Sanvicente remains as the Venezuela national team manager. One casualty from the talks, however, is the Estadio Cachamay, where Venezuela have played – and lost – two qualifiers and will no longer be appearing at during this qualifying cycle. Finally, it was not just a bad night for Venezuelan football but also for the nation’s politics – not to mention democracy. Indeed, towards the end of the game, some fans started chanting against the current government headed by Nicolás Maduro and were audible to those watching at home. It did not take long for those in control of the public announce system to drown these voices out with the sounds of what was most probably the first piece of music they could lay their hands on. Anyone who is familiar with the country’s media will be unsurprised to learn that this unsavoury incident largely went unreported in the leading outlets. 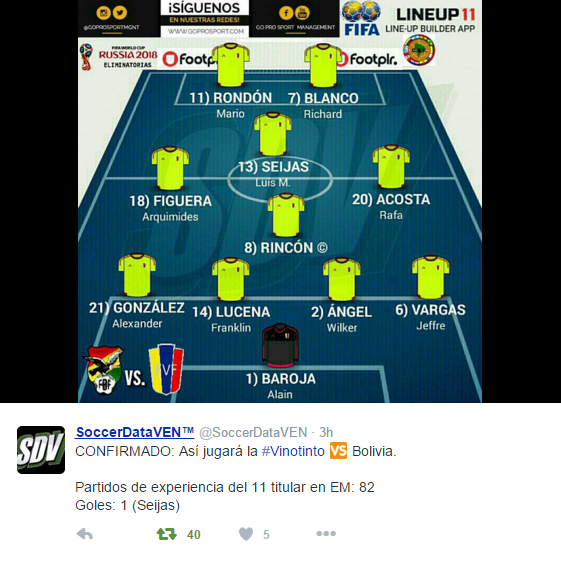 Venezuela (4-4-2): Baroja; Rosales, Vizcarrondo, Velázquez, Cichero; Jeffrén (Martínez, 54′), Rincón, Lucena (Acosta, 46′), Otero; S. Rondón, Santos (M. Rondón, 68′). Ecuador (4-2-3-1): Dreer; Paredes, Guagua, Erazo, W. Ayoví; Noboa, Quiñónez (Castillo, 70′); F. Martínez, Bolaños, Montero (Cazares, 76′); Caicedo (J. Ayoví, 82′). This entry was posted in Uncategorized, Venezuela National Team and tagged Alain Baroja, Christian Santos, CONMEBOL, CONMEBOL Qualifying, CONMEBOL World Cup Qualifiers, Ecuador, Felipe Caicedo, Franklin Lucena, Gabriel Cichero, Jefferson Montero, Josef Martínez, Oswaldo Vizcarrondo, Rafael Acosta, Rómulo Otero, Roberto Rosales, Russia 2018, Salomón Rondón, South America, South American football, Tomas Rincón, Venezuela, Venezuelan Football, World Cup Qualifying on November 25, 2015 by hispanospherical.